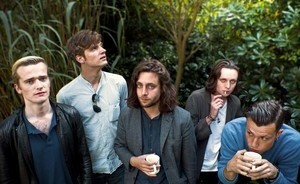 The Maccabees have started work on their next studio album and hope to have it recorded by the end of the year. The band revealed to NME that they are back working in their London studio on the follow up to the 2012 album 'Given To The Wild' and that they are producing themselves for the first time. Frontman Orlando Weeks says: "We went straight back into our studio in Elephant & Castle at the end of last year. We spent time doing it up too - I was painting the kitchen. We had such a busy time after 'Given To The Wild' and to feel excited enough to get on with a new album straight away must mean something." Speaking in the latest issue of NME, which is on newsstands now or available digitally, guitarist Felix White adds: "It's going to be sort of similar to 'Given To The Wild', but it's also going to be more direct and exciting. I think it's going to be our best record." The Maccabees recently won Best Contemporary Song for the 'Given To The Wild' track 'Pelican' at the Ivor Novello Awards. The band released their debut album 'Colour It In' in 2007 and its follow up 'Wall Of Arms' in 2009.